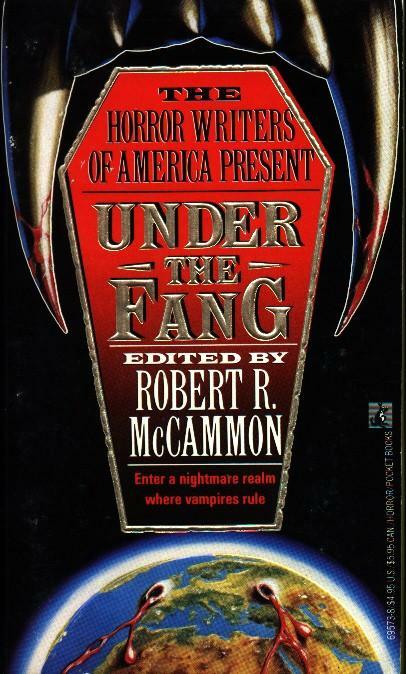 Robert McCammon » Robert R. McCammon's "Introduction to UNDER THE FANG"
Robert R. McCammon's "Introduction to UNDER THE FANG"
It is written on yellow paper, a scrap I found in an upstairs room. The girl with brown hair spoke a few words this afternoon. She said something about hiding her kitten in a closet. Mr. Bramson heard her. So did Mrs. Carrick. Then the girl with brown hair curled up in a comer and started screaming. It's almost nightfall now, and she keeps screaming. Mr. Bramson found a knife in the kitchen. It's very sharp. The other women say they think they can calm her down, and Reverend O'Neill is holding his crucifix and praying with his eyes squeezed shut. I hope they can make her stop screaming, before the light's gone. But if they can't, I'm glad the knife is sharp. I wanted to write down some things. I will fold this paper up and put it into a hole in the wall, and maybe someday it will be read. They came in the night, to the towns and cities. Like a slow, insidious virus they spread from house to house, building to building, from graveyard to bedroom and cellar to boardroom. They won, while the world struggled with governments and terrorists and the siren song of business. They won, while we weren't looking. And now that we see them—now that we know them—it's much, much too late. The ancient hoards are the conquerors now, and we who survive are living under the fang. From Moscow to Tokyo, New York to Los Angeles, they have come to power. I have a question: What will they do with this world they've won through years of nighttime combats and bloodsucking in the dark? We have a shortwave radio. It's Dr. Kelsing's, actually. He keeps the batteries. His wife never says much. I think she's about to crack, because she cries all the time. Myself, I'm done crying. There's no use in it anymore. Besides, I think they can smell tears. Anyway, we listen to the radio and we find out what's happening in other places. Some humans have joined them, become their pets and slaves. They need humans, to watch their hiding places in the daylight. Some humans will do anything for a taste of power, even power reflected from those who cast no reflection. We heard an interesting broadcast from Switzerland. They've got a center there, up in the Alps. It was a science broadcast, and it talked about the hybrids their doctors have created that merge us and them. In Rome one of them calls himself the new Caesar. He's started the Roman games again, and I have to say I couldn't listen to most of what was going on. In one of the so-called entertainments they had humans with no arms fighting other humans with no legs. The winners, I guess, got bitten while the losers just got dead. Is that what the human race has come to? A desperate scrabbling in the dirt, like crabs and grasshoppers? Well, they won't take me alive. I swear to God they won't. But we still have hope. It tatters away a little more every day, like an old battle flag, but without hope we'd all need sharp knives. We've heard the stories. A few bands of brothers remain, scattered in the desolate places. They keep fighting and hiding, just like us. Dr. Kelsing told me he heard not all of them are drunk on blood all the time. He said some of them—a few—have pity for humans. Some of them, he believes, might be trying to help the human cause. I don't know about that. Every bloodsucker I ever saw was only interested in getting his or her rush. They do have their politics, though they can't seem to agree on anything except feeding time. Their kingdoms rise and fall, their cities become fortresses, they declare war on each other, and God help the human herds who get in their way. Let me write this down and make it clear: It's not a good time to have warm blood flowing in your veins. To them, that blood is like heroin and crack, speedballs and Nuke and Blue Crescent all mingled together and calling them. To them, our blood is the damnedest drug you ever could imagine. We're full of what they need to get through the day. Lucky us. Love among the bloodsuckers? Is there such a thing? We were talking about this today: me, Reverend O'Neill, and Mr. Applebaum. Maybe they know something of love. Reverend O'Neill thinks they might. Hate there certainly is, and plenty of that. They've taken over the television networks, the satellite systems, the radio stations, the newspapers, and the magazines. Everything's geared to the graveyard shift these days. They've created their own fads and sports, their own fashions and mythologies. They make movies and write books in a bizarre mockery—some would say a twisted memory—of what it used to be like to be a human being. Where and when did all this begin? Everybody has a different opinion. I believe it was a government experiment gone wrong. Mr. Bramson believes they've been working up to this fever pitch for a thousand years. The Careys believe it has something to do with the ozone layer. That new kid, who wears the heavy gauze wrapped around his neck and wrists, believes it's a disease, like a plague. He's the one who brought in the sack full of hand grenades. These bloodsuckers aren't like the ones who used to be in the movies, who used to slink around wearing black capes and turning into bats. No, these suckers are real. They know computers and lasers, space stations and Star Wars. They know advertising and how to sell to the masses. They know Nautilus machines, steroids, and Nikes. They know too damn much, because, after all, they used to be us. One thing they don't know is mercy. At least, I've never seen any of it from them. So where do we go from here? Do we die as cattle, hanging from our heels and bleeding into designer bottles? Do we rise up and try to fight, or is fighting a useless dream? Where do we go, in a world transformed into a cauldron of black magic, dark hearts, and unholy desires? 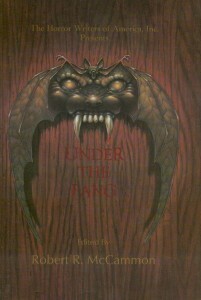 Is there any true hope for us, crushed under the fang? Or would it be easier—and so coldly sweet—to offer our throats and wrists and let the humanity rush out of us in a red tide, so we can learn what it's like to live forever? The light is going away now. Going away, much too quickly. It will be chilly, when the sun disappears. The other women are still trying to calm that girl down, but I think she's gone over the edge. I don't think she can come back. I see it in Mr. Bramson's face and in the Reverend's too. Blue light is lying on the blade. If we have to draw straws again, I'll go out of my mind. The ruins in this part of the city are like jagged teeth. We lie under them, waiting. Why doesn't God hold back the night? Why? They'll be prowling, soon. Prowling in their packs, looking for an easy high. We have the hand grenades. I can smell the fear, starting to leak out of everybody's pores. Mine too. The light is going away. Stop that screaming. Stop it. Stop it, stop it, or we'll have to stop it for you. Like we had to stop my husband when he went over the edge. Being human in these days is a terrible responsibility. What shall we do, if the screaming won't stop? What shall we do? Night is falling now, falling over the cities and towns, over the fields and forests. Night, that time of dreadful trial. In the dark, someone will have to pick up the knife. And now my testament is done. 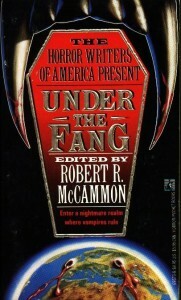 Copyright © 1991 by Robert R. McCammon. All rights reserved. 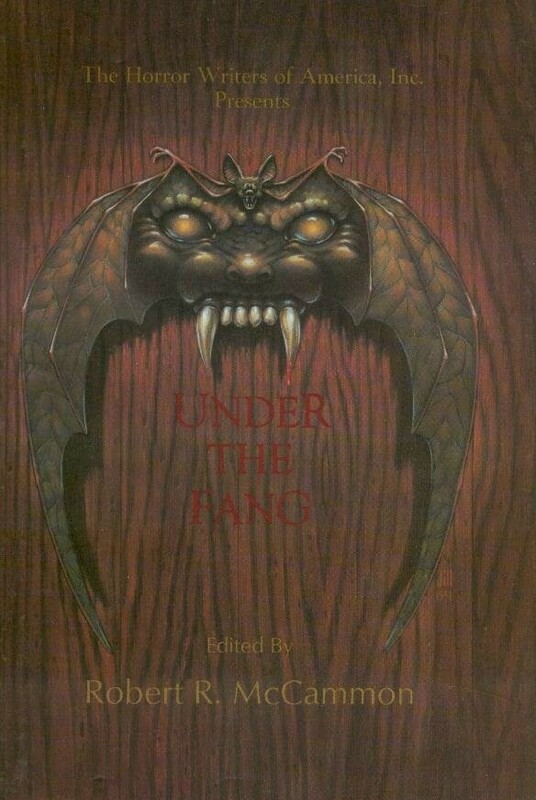 This story originally appeared in the anthology Under the Fang, first published in 1991. Reprinted with permission of the author.